Samarkand alternately Samarqand or Samarcand is the second-largest city in Uzbekistan and the capital of Samarqand Province. The city is most noted for its central position on the Silk Road between China and the West, and for being an Islamic centre for scholarly study. In the 14th century it became the capital of the empire of Timur (Tamerlane) and is the site of his mausoleum (the Gur-e Amir). The Bibi-Khanym Mosque (a modern replica) remains one of the city's most notable landmarks. The Registan was the ancient center of the city. The city has carefully preserved the traditions of ancient crafts: embroidery, gold embroidery, silk weaving, engraving on copper, ceramics, carving and painting on wood. 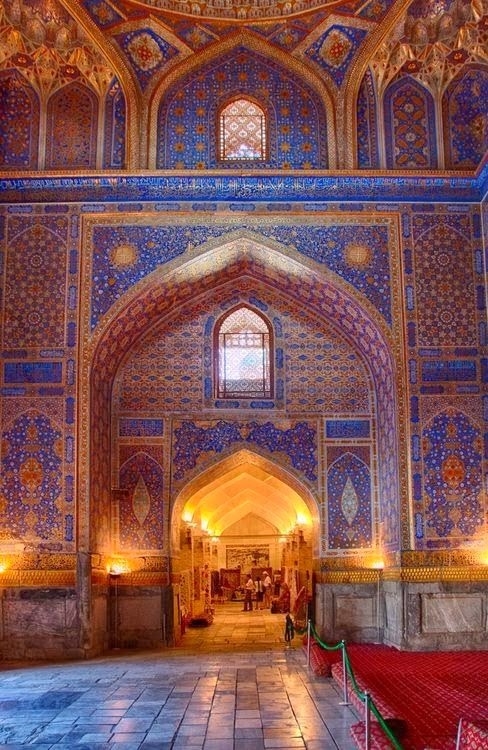 According on Sanskrit texts, the original name of Samarkand was "Markanda", named after the Vedic saint of the same name - Markanda. The Greeks later referred to the city as Maracanda, which is a corruption of its former Sanskrit name. The city was known by an abbreviated name of Marakanda when Alexander the Great took it in 332 BC. There are various theories of how Marakanda evolved into Samarkanda/Samarkan. It is common to prefix "as" or "su" to names in Sankrit to denote its good nature, hence Sumarkanda. Another derives the name from the Old Persian asmara, "stone", "rock", and Sogdian kand, "fort", "town".